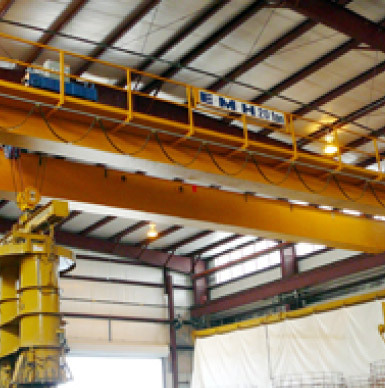 Crane Hoists Built for Hazardous Duty | EMH, Inc. Hazardous duty crane hoists, also know as explosion proof crane hoists, are critical to keep your employees safe. But we’re not filming a summer blockbuster, why are we talking about explosions? Like it or not, general-purpose electrical equipment can and does cause explosions within certain environments. And this is mitigated (hopefully) by utilizing special wiring and other electrical equipment that prevent dusts and vapors from causing an explosion. But still – it is important to have that extra protection of explosion proof crane hoists. So when you are in the market for crane hoists, make sure they are hazardous duty crane hoists – crane hoists like EMH’s that are designed to meet the criteria for a Class I, Division 2, Groups C & D location. But what the heck does that even mean? An area where flammable liquids and gases are handled, but not expected to be in explosive concentrations. But the possibility for these concentrations to exist might occur if there is an accidental rupture or other unexpected incident. An area where ignitable gases or vapors are normally prevented from accumulating by positive mechanical ventilation, yet could exist in ignitable quantities if there was a failure in the ventilation systems. Areas adjacent to Class I, Division 1 locations where it is possible for ignitable concentrations of gas/vapors to come into this area because there isn’t proper ventilation. At the end of the day, picking a crane hoist that is built for the “what if” is critical, and often a matter of life and death as these crane hoists protect your employees from worst-case scenarios. In the next part of this series, we will take a look at what some solutions to mitigate risk.